The fat-soluble vitamins A, D, E and K are found in many foods, do not easily get lost in cooking and digest better when accompanied by fat. They are needed in only small amounts, and the excess is stored in the liver and fat tissues, so healthy persons need not consume them in food every day. While no food naturally provides a significant amount of all four vitamins, choosing combinations of healthful foods can help you reach your daily vitamin needs. Vitamin A helps the eyes see clearly and adjust to light and keeps mucous membranes moist to resist infections. Excessive vitamin A can cause birth defects. 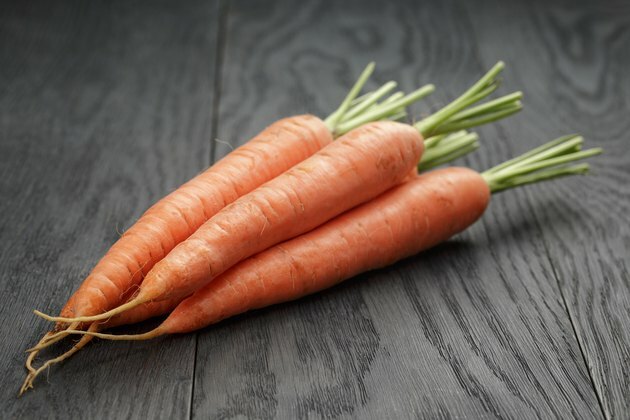 Liver, whole or fortified milk and milk products contain vitamin A. Leafy green vegetables such as spinach, broccoli and brussels sprouts as well as yellow and orange fruits and vegetables such as cantaloupe, carrots, sweet potatoes and squash contain beta-carotene, which converts to vitamin A in the body. An antioxidant and defender against free-radical damage, vitamin E may also guard against cancer and heart disease. Widespread in foods, especially vegetable oils and products containing oils such as salad dressings and margarine, vitamin E is easily destroyed by heat, so choose fresh or lightly processed sources such as seeds and nuts and leafy green vegetables. Other good sources include whole grains, liver and wheat germ. The fact that vitamin D is manufactured by one part of the body and causes another part to respond makes it technically a hormone rather than a vitamin. Vitamin D maintains blood concentrations of calcium and phosphorus for bone growth. Food sources include fortified milk and margarine, cereals, beef, egg yolks, liver and fatty fish such as salmon and sardines. You can also fight a vitamin D deficiency by getting moderate sun exposure -- the exact amount of sun you need depends on the time of year and your location. “Krause’s Food, Nutrition, &amp; Diet Therapy, 10th Edition”; Mahan and Escott-Stump; 2000.